"Doll wearing habit of an unidentified religious order"
Plastic doll is wearing the habit of an unidentified religious order. The doll was labeled by the donor as being a sister of the Missionary Sisters of the Immaculate Conception. 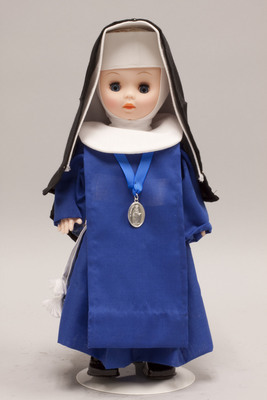 The doll is wearing a blue dress, blue scapular, white wimple, and black veil. A metal medal hangs from a blue ribbon around the doll's neck. A white cloth sash is tied around the doll's waist, from which hangs a black rosary.